Hey friends! This post is unlike any others, but it is already one of my favorites!! I’ve contemplated writing this out for a few days, but have decided I seriously would be doing you an injustice if I didn’t share all of this amazing goodness about my Young Living business. So, let’s get into things!! If you follow along on Instagram, you have no doubt that I have become obsessed with essential oils. If you aren’t following along (what are you waiting for?! Follow along here) go ahead and read this post first. I share my oily journey as well as a few reasons why I chose Young Living there, it’s super important! I think you should try using or becoming part of this business before you turn 30! There’s a list of other things you should do before then over at http://speakoftheangel.com/3-things-try-30/ too! Once you grab your Premium Starter Kit, you are automatically enrolled as a member and therefor a distributor. Basically, you have the option to go business if you want to, but you never have to. It really isn’t too complicated. When your oils come in the mail, you will instantly fall in love, I promise. That obsession easily turns you into a never ending oily blabber and all of your friends and family will be intrigued. So intrigued that they want their own kit. Give them your sign up link and there you have it, your first kit sale! Yay! That’s an extra $50 in your pocket. See, easy right? Have 3 best friends? A best friend, a sister, and a mom? That’s $150 worth of commission and your kit is paid for. Some girls do this even before their kit is delivered to them!! So, I want to go more into depth about my experience with the business side of Young Living and then we’ll get into some FAQs. This business wasn’t really a plan of mine and it sort of just happened. A friend I made through blogging (hey April!) always raved about her oils, I remember always being in awe of all of the things she did with them and I loved that she shared it all on her Instagram. Then one day, she spoke about the business side of Young Living and how she was getting so many oils and other goodies for free AND being payed, like hundreds… all I thought was, “uh, sign me up!” And that’s exactly what I did. Ever since that day, I have been immersed in learning everything about essential oils and all of the other wellness products Young Living has to offer. And let me tell you, it has been one of the most fun things I have ever done! Being surrounded by women with the same interests as you and understanding more about the ingredients in the products you use every single day is so liberating. I love being able to make a more conscious effort when deciding what products I want to use on my body, in my body, and in our home. Plus, within the first month of having my essential oils, I made an extra $160 (which paid for my kit) and I thought, “hey, this is real… this is pretty awesome”. But isn’t this just a pyramid scheme? No! Absolutely not. Actually, pyramid schemes are 100% illegal so you can rest easy knowing this is most definitely not one. Yes, some business models with similar set ups can be sketchy, but those are the companies that ask you to buy product to resell or have huge buy ins. Trust me, I have looked into those types of companies to work for and they weren’t for me either. Young Living is completely different! There has to be a huge buy in, right? How else can I become a distributor? Nope! Like I mentioned before, absolutely no big buy ins. Literally all you need to get started is your own starter kit… that’s it. You don’t need to stock oils in your home to ship out, you don’t need to buy and resell product… Young Living takes care of it all! All you need is your kit (everyone who buys a kit/ becomes a member is a “distributor” but is never, ever obligated to sell… it’s all up to you! ), you can chose exactly which kit you want (although I recommend the Premium Starter Kit) and then you just educate and share. It’s that easy. It’s actually extremely easy, especially once you fall head over heels in love with the product. What is the payment plan like? How can I get my kit paid for before it even gets shipped to me? Okay, so there are a few ways to make commission. When you sell a kit to someone, you make $50. Then, for the first 3 months you make 25% of any purchase they make from the Young Living website. Then, you make a certain percentage off of every single person you have in your “downline”, forever. This is called residual income and is amazing. It’s super easy to create long lasting customers because 1) they’re going to become absolutely obsessed with their oils and need more 2) they want to try more of what Young Living has to offer (cleaning supplies, supplements, beauty products/ make up, oral hygiene products, bath products, food, etc) 3) they’re going to want to be on Essential Rewards (more about this on my Instagram highlights @wellnessavenue) asap because who doesn’t love free oils and money back on every purchase with discounted shipping?! No brainer. So many girls get their kit paid for before it even gets to them. Do you have a sister, a best friend, and a mom? Boom. Three kits sold and that’s your kit paid for. Amazing right? 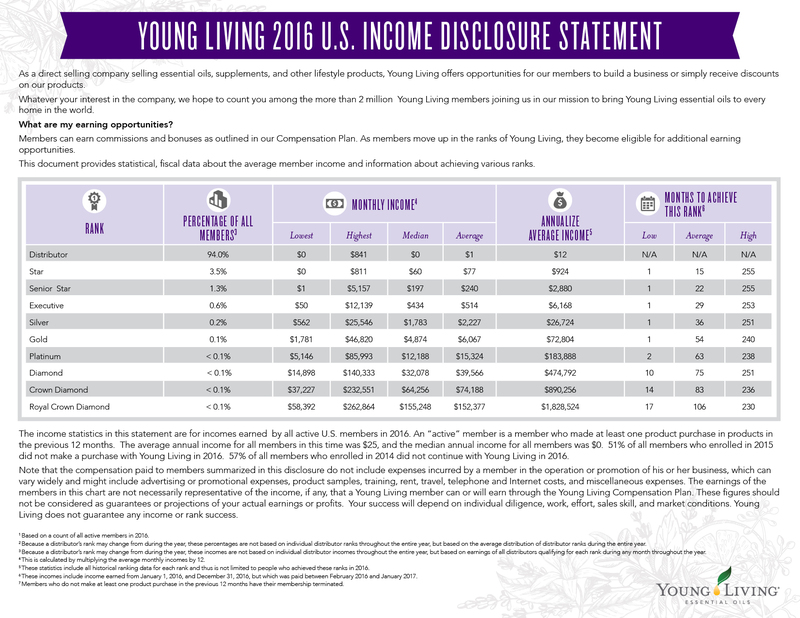 How much can you really be making working for Young Living? I was skeptical about this too and I honestly didn’t think I would be paid until I was in this thing for months… but here I am, making even more my second month than I did my first. When April first shared about the business side with me, she was at the rank of executive. Now two months later, she’s at the rank of silver. She has been doing this business for less than a year. She’s a rockstar. Just imagine what these numbers could do for you and your family. I day dream about it all the time. Q: What is your favorite thing about working for Young Living? A: My favorite thing about having my Young Living business is the freedom. With a two month old, every day is different. I love that I can work around her schedule and prioritize my family. It’s so amazing being able to pick up and go to the beach or the park, ad be able to work from there! Q: How did you get started with the business side of Young Living? A: I got started because I fell madly in love with my oils. When you are so obsessed with a product and it changes your life SO much, it’s easy to share about it. When I saw the earning potential, we started dreaming about what that money could do for us, and I jumped right in head first. It started small and now I have a team of 150 ladies and spend my days sharing the wellness and abundance with them. Q: What is your rank and what does it entail? A: I’m a silver leader with young living. At this rank, the average paycheck is $2,200, which is insane. At this rank, my days consist of leading my team of awesome business girls in growing their own businesses, sharing about oils to new friends, and following up with current members. It’s lots of education and lots of leading my girls towards success in their own businesses. Now that I’m a silver and a mom, I have my hands full, but I love it so much and wouldn’t trade this job for anything. Being on an amazing team is so important if you want to go forward with this business. Having a solid group of ladies to support you and motivate you to learn more is key. Our team is everything I could have asked for and more. I love my fellow oily gals!! If you’re ready to jump on board, change your life for the better, and make extra money each month… let’s do it! Click here to grab your kit & do not hesitate to ask me anything at all! I am here to help you and make sure you get started on the right track. Yay! Reach out to me if you need any help signing up (use the instant chat in the bottom right hand corner, find me on social media @poisedavenue, or reach me via the contact page on PA), I also made this blog post explaining the sign up process. Once your all signed up, I will get an email welcoming you to our team. Then, I’ll send out my own welcome email to you, add you to all of our awesome Facebook groups, and introduce you to our amazing team of business girls. Eek… I can’t wait to have you be a part of our team!! Grab Your Kit Today & Get Started! Yessss, I love Young Living! Thanks for reading girl!! So cool! I love using essentials oils! This sounds like the most incredible program! I love essential oils so I’ll have to look into Young Living! Yes girl! Let me know if you ever have any questions, I would love to help you get started!! It sounds like such a fun business, so proud of you. I have to try these essential oils. Thank you! It is seriously so much fun!! You definitely need to try them out. Ever since announcing on facebook how much I love essential oils, I have been working with a Young Living rep. I just love how affordable their oils are and how well they work to keep my allergies at bay! This sounds like such a cool company! I’ll have to check them out thanks for sharing! Of course, Tonya! Let me know if you ever have any questions!! That’s very inspiring to hear your story and your establishment! I’m also a health freak who’s trying to spread my knowledge in wellness to as many people. Sounds like such a fun business to get into!! I’ve heard great things about them! Sounds like a great side business! Thanks for sharing! This is an interesting side business. I may have to look more into it. It was so cool reading more about the business side of Young Living. I buy from my sister, who is a rep, and absolutely love the products! My recent obsession are the lip balms! I need to try the lip balms, I’ve heard such amazing things!! I also want to try the lavender lotion. Seriously SO many amazing products, I need them all lol! I’ve heard a lot about this business and from everything I’ve heard so far its been pretty legit and life-changing. Keep up the great work in the oil world! I am obsessed with essential oils too! They really do wonders! I call them little miracle workers lol… they seriously are the best. Glad you found a side hustle thats working for you. I’ve never heard of it before so I definitely should check it out. Yes, Gita!! You would love it… it has been so much fun! I’ve heard so many awesome things about these oils. Definitely interesting, and they sound amazing! It has been such a blessing and so much fun!! Thanks Julia!